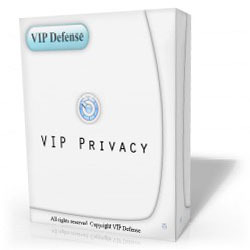 VIP Defense - VIP Privacy - Free your system from privacy leaks and safely surf online. - Download it now! Meet VIP Privacy - the best online privacy keeping program in the entire Internet! Try it now and ensure your privacy forever! How can I protect my personal information online? We all live a public life. In this age of communication we're surrounded by other people 24/7. Your family, your co-workers, your best buddies and people you don't even want to know - they all can reach you any time via your mobile, your email, your PDA or whatever other means are invented by those mad scientists. That is why one of the most valued virtues today is our privacy. You have that right but unfortunately the number of attempts to break it increase every day. A whole lot of offenders would try to steal your personal data without you even knowing of it. It's awful that anybody can known your phone number. But that is much more awful that somebody can know your credit card number one day and use it to get your money. You need to protect your privacy. You need a guarantee. And that's exactly what you get with VIP Privacy. Your Operating System as well as many programs you use every day like offiice suite, browser, instant messanger, online chat, email and file sharing program and a lot of others collect and store some data about you or your system's configuration. Such data is stored in your system usually to facilitate your using different web-services (getting the Customer's support, buying some product via the Internet etc). But many cyber criminals might want to get access to your personal information such as your name, your address, your social security number, your credit card pin and number, passwords, network and email access data. There are a lot of companies that make significant investments to know your browsing history, your interests and even thoughts shared via instant messengers. Both cyber criminals and large companies are able to do so by stealing the information stored by different applications that are installed in your system. VIP Privacy is a tool that lets you search and safely clean up all such private information stored in your system. It does not in any way delete any personal files nor it changes the contents of documents you have in your computer. It deletes only the information collected by different applications that is actually being removed without interfering with your system's and applications' performance. How can you help me to guard my privacy? Being one of the best privacy software available VIP Privacy possesses more than 700 applications and several thousand system leaks storing your personal data that can be used by malefactors. These leaks include cookies, Google search hostory, Yahoo search history, temporary internet files, lists of recently used documents and much more. Just click on the button and VIP Privacy will search for such privacy leaks in your system and your programs and give you detailed description of each privacy leak found. Select the ones you wish to clean up and - voila! - VIP Privacy will delete cookies, clean temporary internet folders, remove your credit card information from everywhere, erases your Internet history and everything else you selected to wipe out. The search and removal processes are fully customizable, so you're always in total control of the situation. No one can ever steal something that you just don't have! In this way VIP Privacy provides a perfect way attain information security in the Internet and protect your private data from spyware, trojans and hackers. The secret of VIP Privacy power is very easy. So, you really recommend downloading this privacy keeping program? For sure! You should start using it to protect your privacy simply because this is the privacy software that proved to be effective and up-to-date by more than 2500 users as of now. Other programs will do some visible job like deleting search history, clearing recent documents menu, clearing temporary internet files, deleting cookies and then say that you're now private. On the contrary, VIP Privacy will thoroughly scan your system for the real presence of your personal information and clears everything stored not only in common Windows places but in storages of more than 700 different application including most of the programs you use everyday as well. These programs include browsers, instant messengers, email programs, office and productivity tools, file sharing utilities, archivers and and a lot of other categories of programs. With our VIP-class privacy protection tool you are safe and free to do everything you want with your computer and browsing in the Internet without anybody knowing of it. Look through key features of VIP Privacy to realize that this is the program you can rely on. is there a program that can encrypt my whole drive? not just individual files and folders? can I select the C drive and encrypt the whole disc? does this work on vista 64bit? Your e-mail address won't be shown to the public.